It’s been great seeing so many new faces, these last few months. If you have questions, there are a lot of Elmers in this room, and many opportunities to get your questions answered – here at the meetings (come early, and come to the pre-meeting dinners), join the Yahoo Discussion group, “Like” us on Facebook page, attend the new Tech Talks (which Bill Willcox will talk more about a little later). Participate in the Newbie Net. We’re here to help. Field Day was a huge success. Like I said in the newsletter, it takes so many people to pull it off. Yet we make it look easy. It’s like a well-oiled machine. We should all be very proud. Thanks to everyone who contributed and participated. Zak Cohen-N6PK announced that he and Norm Campbell-AB6ET completed his challenge of making two contacts on voice, CW and digital. Auction: We have a radio up for auction. Yaesu FT-100MP Mark V with an FP-29 Power Supply and an SP-8 External Speaker. Ben Kuo-AI6YR checked it out, and everything seems to be working properly. Minimum bid is $750. If you’re serious, make a strong bid. You won’t know how many other people have bid, or what their bids are, or if you’ve been outbid. The deadline to bid is 8:00 PM tonight. The winner will be announced after the break. Bill Willcox-KF6JQO: General Class classes started on July 14, for 5 Saturdays, starting at 8:00 AM. There are still 4 classes left. You’re welcome to join in… Technician classes start this Saturday, and runs for 4 Saturdays, starting at 1:00… Both classes lead up to the August 12 Test Session. Classes and the Test Session are in this room. Questions about the classes can be directed to Bill Willcox-KF6JQO. CVARC’s First “Basic Tech Talk” – Antennas was last night and it went very well. About 11 members attended. The Morse group meets tomorrow night at 7:00 pm in this room. 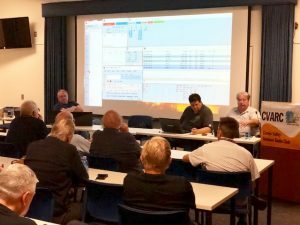 Guest Speaker: Club members Adrian Jarrett-K6KY, Stu Sheldon-AG6AG and Dean Nedelman-K6DIN gave us an overview of some of the more popular logging software programs. After the break, the winner of the Yaesu radio auction was announced. The winning bidder was Norm Campbell-AB6ET. Next month’s meeting is on August 16. 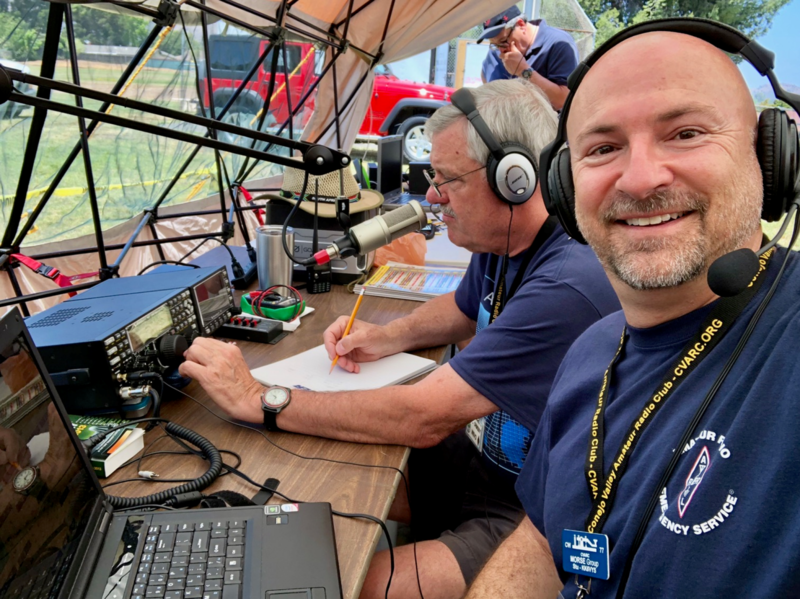 The topic next month is “I Just Got My Amateur Radio License…Now What?” by Stu Sheldon-AG6AG. The pre-meeting dinner is at Don Cuco in Moorpark starting at 5:00.